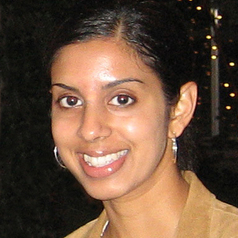 Dr. Sapna Cheryan is an associate professor of social psychology at the University of Washington. Her research investigates the role of cultural stereotypes in causing and perpetuating racial and gender disparities in U.S. society. She has published numerous articles on these topics in journals such as Psychological Science, Journal of Personality and Social Psychology, and Psychological Bulletin. Her work on gender disparities in computer science has been cited widely in media outlets, including in the New York Times, NPR, and Washington Post. In 2014, the White House issued a press release that announced a high school computer science classroom design prize based on her research. Dr. Cheryan currently serves on the Social Science Advisory Board of the National Center of Women in Information Technology. In 2009, Dr. Cheryan received the National Science Foundation CAREER Award. In 2012-2013, she was a visiting scholar at the Russell Sage Foundation in New York City, and in 2016-2017, is a Lenore Annenberg and Wallis Annenberg Fellow in Communication at the Center for Advanced Study in the Behavioral Sciences at Stanford University. Dr. Cheryan received a BA in American studies and psychology from Northwestern University and a PhD in psychology from Stanford University.